Home >> Police Equipment by ASP, Bianchi >> Self Defense Batons >> Steel Baton Sale 16"
Collapsible steel baton 16" for sale. 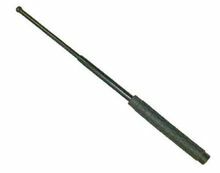 Steel Baton for self defense with rubber grip. Comes with nylon sheath. This solid steel expandable baton will telescope to 16 inches with just a flick of the wrist and retract with a tap on a hard surface. Comes with a rubber covered handle for easy gripping and a FREE heavy-duty nylon holster for easy carrying. A great self defense device that provides power and distance in any confrontation. Carry it in your car, briefcase or backpack to defend against muggers or animals. Tap straight down on solid surface to close. Weighs only 14 oz. Note: Be careful to not abrade the tip. Best to close on carpet or cardboard over concrete to protect the tip. Closed Lengths are 6 and 5/8 inches for this 16" model (rubber handle) and 6.75 inches for the foam handle.